The therapeutic processes of ‘holding’, ‘containing’ and ‘boundarying’ are both literal and metaphorical. They involve the therapist in trying to provide an emotionally caring/protective, facilitating space which respects and holds the client, and also contains emergent emotions and dynamics. The aim is to allow a client to express and explore feelings that may feel too shameful or painful to be shared with others; through this process the client learns to cope with those damaging, overwhelming, or potentially explosive emotions. Of course, it’s important to stress that holding-containing-boundarying is not something we ‘do’ to clients. In relational integrative therapy it is based on a collaborative, witnessing, dialogical process. The concepts of holding and containing evoke the image of a mother caring for a child. In therapy, it is through the relationship with our clients that they feel held and safe. The holding may or may not involve actual physical holding; otherwise, with emotional holding the client’s anxiety, alarm, confusion, distress, and pain are all managed safely by the therapist. In such a holding (and appropriately safe and boundaried) environment, the therapist is consistently there as an attuned, solid, reliable, trustworthy presence. Winnicott (1953) was among the first to highlight the way a loving mother (or significant caregiver) holds her baby and how this could be applied to psychotherapy. 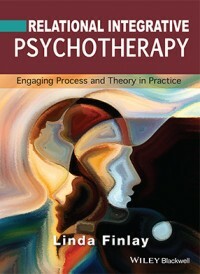 Since his early work, the idea of having a ‘holding environment’ has been seen as a crucial part of therapy. The concept of containing is based on Jung’s (1946) idea that the therapy process can be likened to an alchemical container in which the ‘chemicals’ are the thoughts and feelings of both patient and analyst which have to be held safely. None of us are immune to losing our capacity to cope emotionally where our usual coping mechanisms (e.g. avoidance, suppression) are not up to the task. Patients have taught me that when I allow myself to feel (even be invaded by) the patient’s own unbearable feelings, and I can experience this (paradoxically) as both unbearable and yet bearable, so that I am still able to find some way of going on, I can begin to ‘defuse’ the dread in a patient’s most difficult feelings. A boundary is something that sets a limit or demarcates a line we do not cross. The boundaries we hold in psychotherapy are designed to contain mutual emergent emotional-relational processes and offer a structure for our professional and therapeutic relationships. Ideally they provide a reliable and predictable frame for processes which might otherwise remain mysterious or problematic. They guard the relationship, respecting the rights and responsibilities of both therapist and client (and the separateness between them). Boundaries prevent unhealthy levels of acting out and, in what is often a charged, intimate encounter, they keep both client and therapist safe. They also acknowledge the power imbalance that is unavoidably part of the therapeutic relationship and set limits for the therapist’s expression of power. emotional boundaries – to do with preventing another intruding or getting overly close (physically or emotionally) when it is not wanted and/or containing emotions that threaten to leak out in harmful ways. relational boundaries – offer a private space to be-with another or maintaining the client-therapist relationship as a professional rather than personal one; they also minimise the confusion of dual relationships. It is also not uncommon in therapy to find clients who struggle with boundaries and we might work explicitly with boundaries in terms of helping clients discover and maintain their own healthy boundaries. Perhaps they have been abused in the past and haven’t learned to keep themselves safe. A client with loose boundaries, for example, may have learned this way of being in childhood as a way of coping. Not having boundaries in childhood may have served to keep them safe if they learned that resisting abuse could mean more hurt. The answers to all of these questions depend on cultural, institutional and relational context of the work, the therapist’s theoretical persuasion, and the therapist’s personal values. Boundarying is a process rather than a clear line. Often we just have to rely on our intuitive and judgement and think the situation through logically (ideally in supervision) on a case-by-case basis. For therapists –and clients– who are struggling with boundaries, the paramount question has to be: is this in the client’s interests? If the answer is not a clear “yes”, then the boundarying is possibly suspect. 1) What precedent are you setting up when you go outside the safe boundaries of the contracted times? 2) To what extent are you fully grounded if you reply to crisis calls on impulse? 3) Whose needs are being served if you get caught up in offering more outside contracted times? 4) What part of the client’s history is being repeated as they set up situations where they are not properly seen thus ensuring their needs cannot be adequately met? Beyond working with holding and containing a client’s subjectivity, as therapists, we also hold and contain our own subjectivity. Here we bracket/boundary (in a healthy rather than defensive way) leakages of our own subjectivity so they don’t drown our client. It would be pretty alarming for the client if the therapist couldn’t hold or cope with their feelings, wouldn’t it? Therapy shouldn’t be about therapist’s own needs and healing anyway. But we can’t work with clients’ emotional processes if we are cut off from both their subjectivity and our own. So we need to have sufficient emotional literacy and robustness to avoid loading the client up with our disturbance. When a therapist holds their own subjectivity, they model the process. They show that it is okay to have emotion and that it can be contained. They don’t ‘rescue’, ‘overwhelm’ or ‘persecute’ the client; the therapist needs to show they can cope with emotion without being made unduly anxious. Our vulnerability is important to both own and to manage. For this reason we need our own holding-containing environments. Probably the best, most effective holding-containing comes from having an attuned, affirming, supportive supervisor and/or therapist. Supervision/therapy allows us to be reflexive about our processes as well as to get essential support. There is a danger of our using therapy with a client to act out (or get the client to act out for us), if we lack adequate support for the difficult work we do at the contact boundary (particularly when that work connects with unresolved issues of our own). Holding, containing and boundarying are not things that we do to clients. The process needs to be actively shared, negotiated and dialogical. We can’t just decide to ‘hold’ the client. The client has to accept the holding; they need at some level to take in our witnessing and containing presence and to feel held. Ideally, we work with clients on how they might regulate themselves. We don’t just impose the controls. Therapists who set out to control and limit a client under the guise of maintaining boundaries runs the risk of being potentially coercive, even abusive. Therapists who ‘hold’ or ‘contain’ by fostering dependence run the risk of being manipulative. Exactly how and when to engage the processes of ‘holding-containing-boundarying’ is one of the key ethical/clinical judgments the relational therapist makes in pursuit of artful practice. Sometimes our decision making involves putting in a new boundary or pushing at boundaries. The therapy needs to be shaped in a relational context; it’s not about rigidly adhering to rules or engage in fear-based defensive practice. Ultimately we fall back on our intuition. If something doesn’t feel ‘right’ it probably isn’t. It’s about attuning to the individual’s needs and divining the moment when a client might open to receive our embrace (be it physical or metaphorical) and when they are ready for us to let go of that responsibility. For a useful review of key ideas see: Gravell, L. (2010). The counselling psychologist as therapeutic ‘container’, Counselling Psychology Review, 25(2), 28-33. Casement’s relational psychoanalytic chapters on ‘key dynamics of containing’ and ‘analytic holding under pressure’ illustrate clinical and supervisory implications – see: Casement, P. (1985). 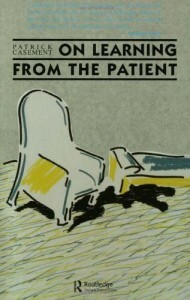 On Learning from the Patient. London: Routledge. Brown, R. and Stobart, K. (2008). 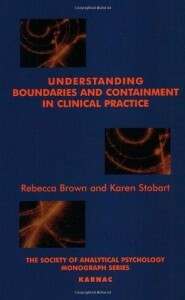 Understanding Boundaries and Containment in Clinical Practice. London: Karnac Books – This book offers a comprehensive account of the nature of boundaries and containment. See the special issue of Therapy Today, 2010, vol.21(8) which explores the nature of ‘boundaries and barriers’ and includes a useful, if controversial, discussion by Totton (Totton, N. (2013). Boundaries and boundlessness. British Association of Counselling and Psychotherapy. Accessed September 2014 from www.therapytoday.net/article/show/2101).